“Synapse” is a generic name for short-interface type expansion joints. Perfect for lines where the installation length is limited. 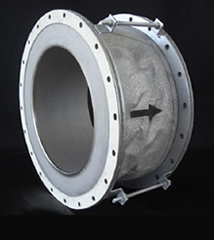 Nonmetal-type expansion joints absorb thermal expansion/vibration for many different pipes including environmental, chemical, in steelworking plants etc., and pipe dislocation can also be handled easily. As expansion parts are non-metal sheets, they have a low reaction force, and are perfect for absorbing displacement for a short time.